At a non-profit fundraising auction, the masks greeted guests on the stairwell as guests entered the silent auction. Venice is a popular fundraising auction theme, and it’s relatively easy to carry out. Though most people associate Venice firstly with its canals, its infamous Carnival is a close second. 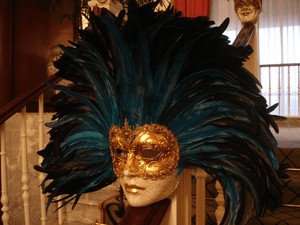 The elaborate Venetian masks worn at Carnival are an easy addition to your silent auction and gala tables. It’s easy to decorate with them. In this podcast, learn how a school and nonprofit used Venetian masks as part of their auction theme.